Most of the work these days was spent on the soundtrack. You might remember a couple of posts ago that I lost the data of one of my hard drives. Well, fortunately, most of my sample libraries and custom sound banks were in the other drive. All I have to do is redo the songs using the sounds I already experimented on and chose. Starting from scratch was tough at first, but remaking something that was good before made it even better, taking a fraction of the original production time. Also, having heard Harmony of a Hunter many times opened my head with ideas of how diverse the Metroid songs could get. You´ll be able to hear a preview pretty soon. In the meantime, I´d like to ask for your help. I´m working on the intro sequence, and my English is quite limited. So, if you have ideas for a short introduction text, I´d love to hear them. Simply head over to THIS THREAD on the forums, follow the guidelines, and write your suggestion. PS: Comment moderation has been re-enabled, don´t be scared if your comment doesn´t appear right away. Doc, I've been reading your blog for a few years now, and have NEVER had a problem understanding your English. In fact, it's kind of a joke among native English-speakers that people on the internet that apologize for their bad English typically speak the language better than some native speakers do! Great idea allowing people to submit stuff. I think giving more opportunity for fan submission will generate more attention for the project. When I find time I'll certainly write something up. In all honesty, though, your written English is way better than a lot of native speakers (I'm assuming your native language is Spanish). I'm looking forward to hearing a little music, though I don't want too much more spoiled. The NCFC is coming up pretty soon. If you want to show off your recent work without spoiling too much, you could make a video with one of the new songs that showcases some of the earlier areas you recently did revisions to. Hey lucky for you my English IS verry good and I would love to help. I am learning Spanish (third week) and can translate a little bit of the basic stuff. Me llamo zach y tu? I am supporting you all the way to the end. And don't worry your English sounds fine to me. hey doc, thanks for the update! i posted on the forums, so hopefully it'll spring some ideas in people. good luck with the project and keep up the great work! I think you meant "Harmony" of a Hunter, not symphony? :P I've been listening to it a lot too. My favourite one there is solitude. Yours is pretty great too, definitely hoping to hear that kind of talent in the game. Is it "symphony" of a hunter or "harmony" of a hunter? These titles are starting to get all confused like the castlevania series. Ah, yes. Sorry about that, I edited the post with the proper album name. Everytime my RSS reader tells me there's a new post, I always hope it's from you. It's usually not, but once in awhile you make my day... Thanks for the update! As for the intro text, can I recommend that you write a first draft and have the community proof read it and make any necessary corrections? Your english seems fine to me, but this would make sure the text is absolutely flawless. I'm glad to see that the data loss wasn't too bad in the end. Keep up the good work! You say your English is limited, but from reading all of your blog posts, I'd say you have a very strong vocabulary. When it's not one's native language, many people claim they don't speak a language well, but they are actually quite good. You are good, don't let anyone suggest otherwise. Glad to see some news, Doc! Personally, I liked the original idea you had 2 or so years ago about showing bits and pieces of previos metroid game endings... even the prime games. I'd love to see at least some minor acknowledgement that the Prime trilogy took place before this. Although admittedly, you never know if Nintnedo will make another game before this one. Pre-Metroid 2 is the easiest spot to fit in other games since they can have metroids without retconning their (near) extinction in this game. Nintendo is re-releasing Metroid II and brainstorming an HD remake for the WII U console classics. About time! Didn't want to have to register, so here's an idea. After the defeat of Mother Brain and the Phazon incident proved the danger of the Metroid, the Federation decided to wipe this scourge from existence. Many ships went to their homeworld, SR388, in an attempt to eradicate this galactic threat. None were heard from again. Now, I've been contacted. My mission: go to SR388 and exterminate all Metroids. Even one will spell certain doom. It's short, it acknowledges the Prime series and the original Metroid without requiring any change, and it sets up this game nicely. Just in case he doesn't check these comments, would someone mind posting my above comment to the forum? Mine is the Sept. 11 comment at 8:17 am. If you haven't already, try Reserve Tank VARIAtions, a great metroid based-album by ocremix artists. It's great stuff, and the story behind the creation of this masterpiece is also heart-warming. PS. : Good luck on your project! Prime wasn't that great of a game. I think anything Doc decides is great! Sometimes I wish the game was out already! Soon it will be, I know it. I can't wait to play the game Doc! New Metroid games are my favorite. Much time will be spent finding all items! You have done a great job so far. Blasting Metroids is the best thing. Ultimately I wish for Nin to make 2.5D. The AM2R remake should wake up Nintendo. This will show them 2D gaming is great! Everyone here would be happy then. X-ray scope in the remake??? Many months I've been a fan of Doc. Feeling anticipation each update for release! Comment moderation! Good move Doc! Seriously, a tiny bit overdue, yes? Good update. I made a song for the queen's lair on fruityloops a few years back and imported the file into cooledit, to balance it and print it as an MP3. Not sure if you are interested, but if you are, let me know. Be happy to send it to ya if you wanna give it a listen! As for the last post(er), it was quite a rant of obtuse ideas. Now this may sound like I am being rude, but please dont take it that way. I just have questions. It was almost like you tried to smash 5 seperate ideas into haiku spagetti together. And for the above Anon post, who commented that Nintendo was doing both a re-release of M2:ROS, and beginning work on a hd remake, do you have a link where you got this information? It would be much appreciated! I'm gonna love to hear Metroid 2 remixed themes, but I think Metroid 1 title theme should be there too, because it's the theme of the whole series. "My name is Samus Aran, I'm a solitary bounty hunter. Few years ago I landed in Planet Zebes Crater, to fight the Space Pirates in their main base down there. They were controlled by the artificial life form, Mother Brain. Later, she revealed her deadliest weapons, the metroids, floating creatures that drain energy and bread fast. I killed all of them and Mother Brain, resulting in the destruction of the base. I was wrong... it was still alive, stole my phazon suit and took human form, becoming like a copy of mine. Aware of the danger of the phazon, the Federation decided to find phazon reserves and destroy them, including Planet Phaaze, an entire planet made by Phazon. The war against the pirates was more violent than ever, but the Federation made it. About me, I finally killed that mutated metroid that copied me. The Federation could see what only 1 metroid feed by phazon could do, and even the phazon being gone and the pirates weakened, the metroids are still considered a huge threat. Now, the Federation discovered that the pirates brought most of them from the forgotten Planet SR388. There are still some metroid hives there, the Federation is ordering me to go there and kill all of them. I must hurry." Well, I know I wrote a lot, but it's important to remember not only Metroid 1, but Prime series too, to remember why the metroids are dangerous enough to the Federation decide to extinct them. I'm tired now, but later I can try to read again my texts and make them as shorter as possible. Remember to put scenes (from Metroid Zero Mission graphics) or pictures when the facts are discribed. "Didn't want to have to register, so here's an idea. The Metroid threat ends here, on SR388..."
I just think you should, based on Zero Mission's graphics, make a few cutscenes showing facts from Metroid 1 (mainly) and little from Prime (the metroid prime itself and the phazon). About the ending, I insist that after Samus leaves the planet with the baby, you should put a dark music and show X-Parasites realising that their enemies were dead, and then start infecting creatures. Some people liked this suggestion in other pages. I hope you make it, please. Excelentes ideas las de Anonymous y Bruno, sería genial que hubiese al menos una versión del AM2R mostrando al Parasito-X (la verdadera maldad según los Chozos), como una escena final después de que su enemigo fue exterminado. Después de todo, el Metroid 2 Return of Samus es uno de los juegos claves entre todos los demás, y es el que menos detalles ofrece para entender la base histórica del juego, sería excelente ponerle añadidos que ofrezcan al jugador acercarse más a la historia de Samus. Sin embargo, igual sería bueno mantener una versión "tradicional", que mantenga la esencia del Metroid 2 original, porque también todos nosotros debemos recordar que este juego es el único que no tiene una secuencia de escape, y también él es el único que quizás muchos ven como un final "hermoso". I like Bruno's idea for the X Parasite cutscene at the end of the game after Samus leaves SR388 in her ship. It could even be a secret/bonus cutscene that gets unlocked upon completing the game under a certain amount of time and/or collecting 100% of the items. This game looks incredible! I finally got around to reading your much, much older posts (the ones from 2008), and it sort of inspired me to make a metroid fangame that I've wanted to make for a little under a decade now. Only in mine you play as a GF Marine stranded in some military complex. On a side note, I do have a bit of criticisms about the confrontation tech demo, though. Its CPU usage rates are pretty extreme for a 2D platformer. Now I might not have the best computer in the world (2.34 GhZ single core, 64mb video ram -_-); but it shouldn't use over 70% of the process time when running, especially when paused (it jumps up to about 80%-90% on the pause screen). Also it lags a lot when certain types of enemies appear on screen. Those blue round guys from norfair in zero mission, the drill skrees, and the frog-looking guys from fusion all cause the framerate to drop dramatically, even on relatively fast machines, when they do basic things like hopping around. If you could fix this, it would make the games engine so much better. ^ Hey Bruno -- those ideas would be great if they weren't major spoilers! :\ I haven't yet completed the Prime Trilogy, and you gave no warning with regards to Prime 2 & 3 spoilers. Please have consideration for other fans in the future. Thank you. Hace un tiempo destrui la base de los piratas espaciales ubicada en el planeta zebes, donde estaban clonando metroids robados y a su lider Mother Brain. Acabo de recibir una señal de socorro de parte de la federacion galactica. Parece que enviaron un equipo armado para destruir a los metroids en su planeta natal. El planeta SR388. Pero este equipo no ha logrado dar señales de vida. En esta ocasion la federacion galactica quiere que yo realize esta mision. Es mejor que me de prisa si quiero exterminar a los metroids antes de que los piratas espaciales se los roben. Few years ago, the Space Pirates, old enemies of the Galactic Federation, surprised us with a new weapon: metroids, floating beings that drain energy and breed fast. As the Federation fought the pirates, they sent me, as a bounty hunter and ex-Federation soldier, to Planet Zebes. I landed in the main space pirate base, controlled by the artificial life form Mother Brain. I killed her and all metroids there, resulting in the base's explosion. Not too long later, the pirates came back with more metroids, but they were also feeding some with a hugely radioactive substance named phazon. The metroid that survived had mutated to something bigger, known as Metroid Prime, and I had to defeat it myself with phazon. But it was still alive and stole my phazon suit, changing to humanoid form and copying me. In the end, the Federation defeated the pirates and destroyed all phazon reserves known, and I killed the Metroid Prime. The pirates are weakened and the phazon doesn't exist anymore, but the metroids are still a threat. Finally, in the Space Pirates' data, the Federation discovered the metroids' homeworld: planet SR388. They sent many ships there, none ever came back. But we know that the metroids are not many now. almost time to update the site doc. Guys I'll say it again, IT'S OVER!!!! DOC ALREADY PICKED ONE!!!!!!! You should definitely write the intro yourself, if anything, someone can proofread it or something, but keep in mind that your English is way better than the English of most of the people that comment on this blog. I don't like the idea of changing things and referencing the past games in the intro sequence(Or on the game's ending), it seems a bit too forced. If anything, you could reference the pirates' attempt to take control of the Metroids, since its something that's important to Metroid 2 and its more "on topic" with the current events. Hey Doc, I know this isn't a big deal but I have a PS3 controller connected to my PC. It works fine and everything on AM2R but I can only get the Analog stick to allow me to move. Can you program/enable the D-pad for movement in AM2R? Which intro did Doc choose? Frothing at the mouth for the game! Keep up the good work Doc! Ulcers will develop without patience! No one has said their favorite game. I think my favorite is Super Metroid. Gonna play it again soon. Everyone should try it at least once. Really hope AM2R is just as good! Some day soon we'll find out??? She could begin talking about the old war between Galactic Federation and Space Pirates, then their ships appear shooting each other in space. Then she says the Federation sent her to Zebes to find out what's the pirates' new weapon (metroids), as they fight in space. To show Metroid 1's facts, you could use Zero Mission's scenes (planet Zebes from outside → crater → Kraid → Ridley → metroids draining pirates and attacking Samus → Mother Brain → explosion). That extension from Zero Mission is not necessary at all. It's important that Samus mention the metroids often, because in Metroid 2 they are THE quest. It's important that you mention Prime Trilogy too, because its facts make stronger the reasons to kill all metroids. But try to show its facts quickerly than Metroid 1's facts, which are more important. "Few months later..." → Pirates invade a space lab and Samus follows them in her ship. In Tallon IV, she discovers that they're feeding metroids with phazon and the Metroid Prime appears. She uses the phazon (then her suit gets purple) and defeats it, than informs the Federation about the phazon and existence of more metroids. Prime 2's facts are not important, only Dark Samus, then you show a purple light (the etheral Prime) attacking Samus (then her suit becomes yellow again) and it becomes Dark Samus (could be a black SA-X). Samus says she defeated it again, but the final battle (Prime 3) was next to planet Phaaze, where the Federation was destroying the last phazon reserves, weakening the pirates and killing their metroids, as she kills Dark Samus herself. Finally, they call Samus again for her huge experience with metroids and ask her to destroy the last hive before they breed again. Of course they don't know there are chozo ruins there and that metroids can evolve. Well, all this I just wrote are the details of introduction animation. If you improvise like this, it's gonna be nice. About the DURING game scenes, sometimes Samus could talk to herself alone, comment her surprise to see metroids evolving once all that time she only saw larval forms. She could also comment about chozo ruins there and their robots STILL working. When the 8 larval metroids appear, she could comment "I must hurry before they breed again". Then a very dark scene of the Queen, maybe her shadow behind Samus and Samus looks back, scared. The baby hatching should be like her flashback in Other M, clearly had no courage to kill it. In the end, she could comment she doesn't know why she's taking it with her, but maybe the Federation can find out something. Don't forget the scene after credits, dead metroids and empty metroid shells everywhere, then the yellow goos (X parasite) appear and infect a frog, then the screen gets dark, with a very dark music. 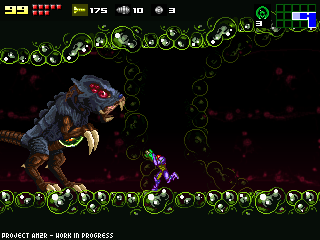 This scene would discretely connect the game to Metroid Fusion. Well, that's it. I hope you can improsive the animations with no problems and find someone to draw the scenes. Keep the good work. I can't wait for your game. I almost forgot! To explain why in Metroid 1 and the whole Prime series the evolutions never appeared before, you can say that the evolutions were too dangerous for the pirates to steal, that's why they could take and clone only larval metroids. can't wait for the game, please update the blog! What program do you use to make the music Doc? Please, use the musics from trailer 2 and 3 to the main corridors. I just love those versions. And Metroid 1's original title theme, even not being in the original Metroid 2, that theme is the mark of Metroid series. You're holding us in suspense, Doc! It's been a month since the last update! Screencaps, progress reports, and perhaps an estimation of progress til completion would be really great. This project has come a LONG way, and although I know your podcast originally said you wanted it out this year, it'd be good to know how far/how close we are to that goal! Sometimes too long introductions can get the player bored before the game starts. That's a huge mistake you can avoid, Doc. I think you should show facts from Metroid 1 with Zero Mission's videos, but Prime series you should show as fastly as possible. Try not to make the introduction as long as Fusion's, make it as long as Super's and that's okay. And I think the scenes from Metroid 1 should be longer and have more importance in the introduction than the whole Prime series. Try to make Prime series' scenes as short as possible. Dude come on its been a month! give us the next update ! First of all, Doc is likely waiting to post an update until the NCFC later this month. I see absolutely no reason to mention the Prime series other than saying that the metroids have been a dangerous threat in the past. Keep the intro short. There's no need to mention irrelevant stuff that would distract from the actual game. Maybe have it like Super Metroid's intro, with an explanation of the previous games and short videos showing the mentioned battles, like Samus fighting the Mother Brain, Metroid Prime, the Ing horde, stuff like that.